Published in: Papenfuss, G.F. (1944). Notes on algal nomenclature. III. Miscellaneous species of Chlorophyceae, Phaeophyceae and Rhodophyceae. Farlowia 1: 337-346. The type species (holotype) of the genus Zonaria is Zonaria flava C.Agardh. Lectotype locality: "Ind. Or" (Madagascar) (Silva, Basson & Moe 1996: 614). Lectotype: CN C7F85 (De Clerck 2003: 186). Notes: Silva et al. (1996) recommend consulting Papenfuss (1952: 169) for more information on the lectotype locality of this species. De Clerck (2003) also recommends consulting Papenfuss (1952: 168-170) for typification and confusion with D. interrupta. According to Silva et al. (1996: 614) the name Zonaria lobata,/i> has been misapplied to this species (Barton, 1893: 110, Knysna specimen). Accesses: This record has been accessed by users 1581 times since it was created. Stegenga, H. & Kemperman, T.C.M. (1996). 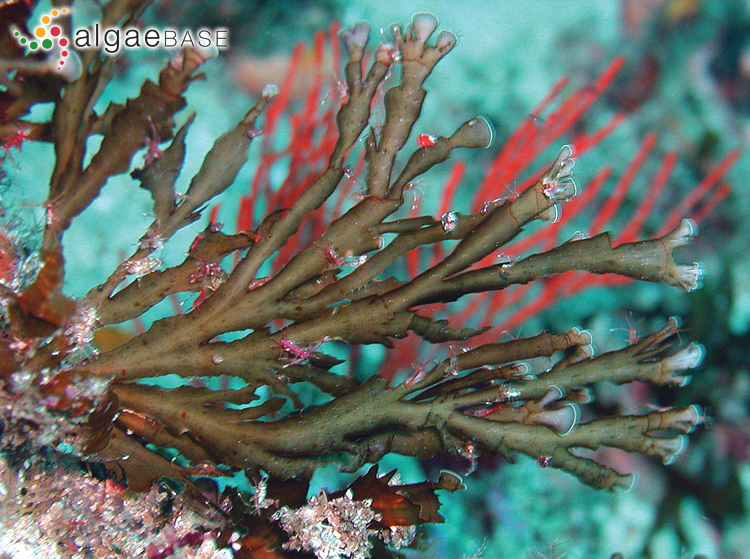 Notes on Ceramiaceae (Rhodophyta) from the Eastern Cape Province, South Africa. II. Zonariophila semiendophytica nov. gen., nov. spec., a minute epi/endophyte of Zonaria subarticulata (Lamour.) Papenf. Blumea 41: 125-134.